Year 2 - The planting of the Second White Tree at Minas Tirith, Death of Isildur by orcs in the Battle of the Gladden Fields. Isildur himself loses the One Ring in the Anduin. TA 3 - Ohtar brings the shards of Narsil to Imladris. TA 10 - Valandil becomes the 3rd King of Arnor. TA 109 - Elrond weds Celebrían, daughter of Celeborn and Galadriel. TA 130 - Elladan and Elrohir are born to Elrond and Celebrían. TA 241 - Arwen Undómiel is born to Elrond and Celebrían. TA 420 - King Ostoher rebuilds Minas Tirith. TA 492 - The Easterlings invade Gondor. TA 500 - King Tarostar successfully destroys defeats the Easterlings, he changes his name to Rómendacil meaning "East Victor". TA 541 - Easterlings invade Gondor once more, slaying King Rómendacil. c. TA 550 - King Turambar of Gondor defeats the Easterlings of Rhûn; the Kingdom of Rhovanion becomes an ally of Gondor. TA 861 - King Eärendur of Arnor dies, his sons dispute over the Kingdom and after a bloody civil war, Arnor is divided into three smaller Realms. Arthedain, Cardolan and Rhudaur will dispute over the Weather Hills and other territories for hundreds of years to come. TA 933 - Eärnil I of Gondor takes Umbar in a surprise attack. TA 936 - Eärnil I lost at sea. TA 1000 - The Istari come to Middle-earth. TA 1015 - The Haradrim besiege Umbar in an attempt to recapture the city. 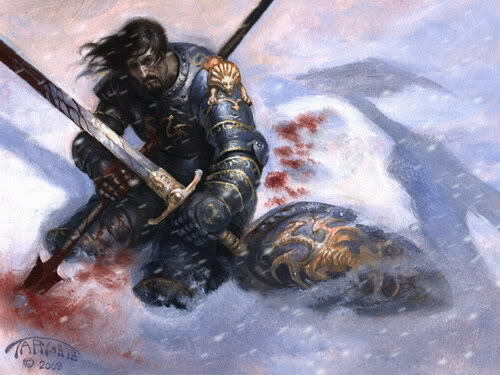 King Ciryandil of Gondor is slain in the siege, Ciryaher takes the throne. TA 1050 - Ciryaher conquers Harad and takes up the name of Hyarmendacil meaning Southern-Victor. Gondor reaches the height of its power. The Harfoots cross the Misty Mountains into Eriador. Sauron takes up his abode at Dol Guldur, Greenwood is renamed Mirkwood. TA 1149 - Death of Hyarmendacil I, Atanatar the Glorious takes the sceptre of Gondor. Under his rule, the power of Gondor begins to wane. TA 1150 - The Fallohides migrate to Eriador. c. TA 1200 - Rulers of the Kingdom of Rhovanion assume the title "King of Rhovanion"
TA 1248 - Rómendacil II, the Regent of Gondor strikes a decisive blow to the Easterlings; forms a strong alliance with Rhovanion, to which he cedes all the lands east of Anduin. TA 1250 - Rómendacil II sends his son, Valacar to Rhovanion as an emissary. Valacar falls in love with Vidumavi, Vidugavia, the King of Rhovanion's daughter. TA 1300 - The shadow over Middle-earth lengthens. The Realm of Angmar is formed north of Rhudaur under the rulership of a Black Nûmenorian, later revealed to be Witch King. The Nazgûl begin to reappear. Orcs begin to infest the Misty Mountains. TA 1356 - King Argeleb I of Arthedain is killed in defence of the Weather Hills during an invasion by Rhudaur, now controlled by Angmar; his son, Arveleg I, ascends the throne. TA 1366 - Valacar ascends the throne of Gondor. TA 1409 - Cardolan is ravaged by the kingdom of Angmar and Rhudaur is terminated; Weathertop watchtower, and fortifications are burned and destroyed. TA 1410 - Carn Dûm is besieged by an army of Elves. TA 1432 - Eldacar succeeds his father, Valacar, as King of Gondor. Castamir the Usurper, Lord of the Ships, and a large following of Nobles are distressed by the half-blood King. They lay siege to Osgiliath. TA 1437 - Castimir breaks into Osgilliath. The Palantir is lost in the Anduin and the Dome of the Stars is destroyed. Eldacar flees Gondor, his son, Ornendil is captured by Castimir and executed. TA 1447 - Eldacar reclaims Gondor with an army of Northmen and kills Castamir at the Battle of the Crossings of Erui. Castimir's sons take refuge in Pelagir, Eldacar lays siege. TA 1448 - The sons of Castamir the Usurper and most of the fleet of Gondor flee south to Umbar, and become known as the Corsairs of Umbar. TA 1540 - King Aldamir of Gondor is slain by Haradrim in the Siege of Umbar. TA 1600 - Two Fallohide brothers Marcho and Blanco decided to cross the River Baranduin, later Brandywine and settle on the other side, and are followed by large numbers of Hobbits. King Argeleb II gives permission of the founding of the Shire. TA 1601 - The Shire is first settled by Hobbits. TA 1634 - The Corsairs of Umbar attack Gondor, slaying king Minardil at Pelargir, and raiding the city. TA 1636 - The Great Plague decimates Gondor and Rhovanion, the watch on Mordor is abandoned and the Undeeps are deserted. TA 1810 - King Telumehtar of Gondor destroys Umbar; renames himself Umbardacil. TA 1851 - The Wainriders overrun the Kingdom of Rhovanion. TA 1856 - The Wainriders first attack Gondor. TA 1964 - Arvedui, son of King Araphant of Arthedain, ascends the throne. TA 1970 - Elion, son of Elrond and Celebrían, and his twin sister, Allynna, are born. TA 1974 - The kingdom of Arthedain is conquered by Angmar. TA 1975 - Gondor destroys Angmar in the Battle of Fornost, death of Arvedui. TA 1980 - The Moria Dwarves awaken Durin's Bane, a Balrog, which kills Durin VI, king of Khazad-dûm; the Nazgûl return to Mordor and lay siege to Minas Ithil. TA 1981 - Durin VI's son, Náin, is also killed, and the Dwarves flee Moria; deaths of Amroth and Nimrodel. TA 2050 - The end of the royal dynasty of Gondor (until the return of King). TA 2430 - The approximate birth year of Sméagol. TA 2460 - Sauron returns, possessing one of his to lieutenants. TA 2501 - Eorl the Young, lord of the Éothéod and 1st King of Rohan (2510–2545). TA 2509 - Cirion, Steward of Gondor, sends summons to the Éothéod for military aid; Celebrían is waylaid by orcs, receives a poisoned wound, and consequentially departs Middle-earth. TA 2545 - Eorl the Young, 1st King of Rohan, dies in the battle in the Wold against the Easterlings. Brego succeeds him as the 2nd King of Rohan. TA 2570 - Aldor, aged only 26, becomes 3rd King of Rohan at the death of his father Brego. TA 2645 - Fréa becomes 4th king of Rohan after the death of his father Aldor ('the Old'). TA 2746 - Amrothos, 15th Prince of Dol Amroth, falls while defending Dol-en-Ernil against the Corsairs of Umbar. TA 2758 - Dunlendings, under Wulf, invade Rohan, supported by the Corsairs of Umbar. Long Winter of 2758 - 2759 - The Dunlendings lay siege to Hornburg. TA 2759 - Helm Hammerhand, King of Rohan, is killed by the Dunlendings. He is succeeded by his nephew Fréaláf Hildeson; Saruman settles in Isengard. TA 2763 - Balin is born. TA 2783 - Glóin is born. TA 2798 - Fréaláf Hildeson, 10th King of Rohan, dies. He is followed by his son Brytta Léofa. TA 2799 - The Battle of Azanulbizar is fought on Moria's East Gate, in which the Dwarves. defeat Sauron's minions but are defeated by the Balrog Durin's Bane. TA 2842 - Brytta Léofa, 11th King of Rohan, dies. Succeeded by his son Walda. TA 2851 - Walda, 12th King of Rohan, is killed by an orc, his son Folca succeeds him. TA 2864 - Folca, 13th King of Rohan, is killed by the Boar of Everholt. He is succeeded by his son Folcwine. TA 2879 - Gimli son of Glóin is born. TA 2885 - Harondor is once again claimed by the Haradrim, supported by the Corsairs of Umbar. - Fastred and Folcred, the twin sons of king Folcwine, were killed during the Battle of Crossings of Poros. TA 2890 - Bilbo Baggins is born. Fell Winter of TA 2911 - TA 2912 - wolves invade the Shire. Tharbad is ruined in the following the floods. TA 2930 - Arathorn II becomes the Chieftain of the Dúnedain. TA 2933 - Arathorn II is killed while hunting orcs. TA 2933 - Brother of Arathorn II becomes the Chieftain of the Dúnedain. TA 2934 - Denethor is assassinated by Harad Assassins. Arathorn's brother returns as King of Gondor. TA 2935 - Fengel, King of Rohan, is killed by Orcs from Isengard during a diplomatic mission to Saruman. TA 2935 - Saruman is killed by his apprentice. Apprentice rises to power. TA 2937 - Dáin, Thorin, Elrond, Elladan, and Elrohir, lead an army to retake Erebor. TA 2938 - The attempted recapture of Erebor ends in failure leading to the deaths of Dáin, Elrond, Elladan, and Elrohir. Ulrin and Elion are crowned kings of the Dwarven and Elven kingdoms respectively. Arwen departs for Undying Lands grieved of the loss of most her family. TA 2939 - Ulrin begins plans with Elion over a second attempt to recapture Erebor. TA 2940 - The attempt to recapture Erebor was succesful and Ulrin grants Elion the town of Dale, below Erebor in order to improve Elvish-Dwarf relations. They then begin the rebuilding of both cities. TA 2941 - Rebuilding of Erebor is complete. Mordor gears itself for war, gathering its allies. Meanwhile the Free Peoples of Middle Earth prepare to defend to the last. It was the 2933rd year of the Third Age. Arathorn was headed north into Angmar to do some scouting and recon of the Orc forces there, accompanied by a few Dúnedain Rangers. He left his brother in charge of the Rangers and the rule of Eriador. Arathorn had to stop though for the air was cold frigid, and night was coming. He began to set up camp, once he was done, he and the rangers rested. What they not know was that they were being watched, watched by a horde of Orcs. Once dusk was arriving and the Rangers began to sleep the attack began. The Orcs came down upon the Rangers, Arathorn's company was severely outnumbered. The Orcs slaughtered them all in a matter of minutes, all except one. Arathorn fought on, eliminating numerous Orcs, he attracted the attention of the Orc Captain, Huglush. Huglush ordered the lesser Orcs to stop attacking and to instead encircle Arathorn. Once the circle was complete, Huglush stepped in, wearing heavy chainmail and wielding a heavy spear with a heavy axe on his back. Arathorn, with his plate armor and his shield and sword, awaited the Orc challenger. He held his shield high, for Huglush was tall, and prepared his sword. Huglush smiled and struck at Arathorn's shield with his spear. The blow glanced off the shield, exposing Huglush's arm and allowing Arathorn to slash at Huglush. The attack sliced a part of the Orc's arm, causing the Orc to scream in pain. Huglush was unphased, however, simply jumping back to give space for another attack. This time the Orc used the same attack as before but he was prepared. Huglush rolled with the glancing blow, allowing him to roll behind Arathorn and deliver a decisive blow to the Ranger's back. Arathorn fell to the ground, trying to turn to face Huglush unsuccessfully. Seeing his chance Huglush speared Arathorn in the chest from behind. Arathorn doubled over in pain, but he still drew breath. He summoned the strength to look at Huglush, who had already drawn his axe. Arathorn realizing his fate, bowed his head and prepared for the strike that was to come. Huglush then brought down the axe on Arathorn's head, severing it from his body. The Orc captain then grabbed the fallen warrior's head and raised it for all to see. There were many cheers by the Orcs that night. The year was 2934 of the Third Age, Denethor was celebrating the expanse of the Gondorian Kingdom in his hall and had invited numerous guests for a great feast. Even the guards were to enjoy themselves, it was as if the Steward had forgotten the worries of the world. He continued eating, drinking, and partying until one of the guards said "What of the Haradims in the South, sir?" Denethor looked at the guard and laughed, some of the food in his mouth sputtering out. "Those uncivilized bastards? What of them?" he asked still filling his mouth with more drink and food. The guard smiled uneasily "I heard they were moving closer to our lands" he said as Denethor smiled and yelled out "LET THEM COME, THEY WILL FALL TO MY BLADE!" at that moment he grabbed his sword and swung it like a wild man, the guests cheering. "No you will fall to ours" a shadow said, and immediately the feast fell silent. Denethor's eyes glimmered in slight fear "Who said that?" he asked, his voice a little shaky and afraid, he held his sword tight in his grip. He saw the fearful eyes of his guests and thus he had renewed courage and spoke out again "COME OUT HERE SO I CAN SLIT YOUR THROATS!" At that exact moment you could hear the whiz of arrows as the guards fell dead, arrows lodged in their throats. Immediately two more arrows followed, landing on Denethor's clothes and pinning him to the chair he was sitting in. All the guests fled and out of the shadows came two men in Haradim garb. The one who appeared to be the leader drew his bow back once more and fired one last arrow into the Steward's chest. The arrow was enchanted for as soon as it landed, Denethor's skin began to disappear and all flesh was gone in a matter of seconds. He was a mere skeleton now as the leader put a note in the Steward's hands. The note said that the Haradim will have their revenge and with that the pair disappeared.